The stripped back dining experience. Eating establishments have a hard time maintaining a ‘cool’ brand unless they’ve: 1. Already established a marketing gimmick i.e. Roscoes Chicken & Waffles or 2. They have a somewhat on-trend, up-to-date brand upon their opening. This is a passion project of mine whereby I wanted to balance an on-trend brand with a functional, distraction free eating experience. Check out the project and it’s collateral below. I had the idea of creating a simple but effective feedback system that would encourage participation resulting in more data and therefore more accurate data. I wanted to do this without gimmicky incentives like vouchers. Making use of the disposable menus, I included a perforated edge where the diner could write (with our cool fluro yellow markers or their own pens) honest feedback and pin it up on a wall in the restaurant thus culminating a fully branded crowd-sourced feature wall (below). I tasked myself with creating some non-gimmicky promotion material to have at the restaurants counter when paying for the meal. Something that looked nice and something that you didn’t need to keep in your wallet until the next time you ate there. You pick one up when you eat there first, txt the number on the card and your name will be stored in the restaurants database for an extra $50 off their next meal, making for an awesome database and likely an awesome surprise next time they dine. Creating a simplified menu rotation was important to me. Going into a restaurant and having to ask the server how big each meal is and if it would feed / be too much for X amount of people is a cumbersome way of ordering. 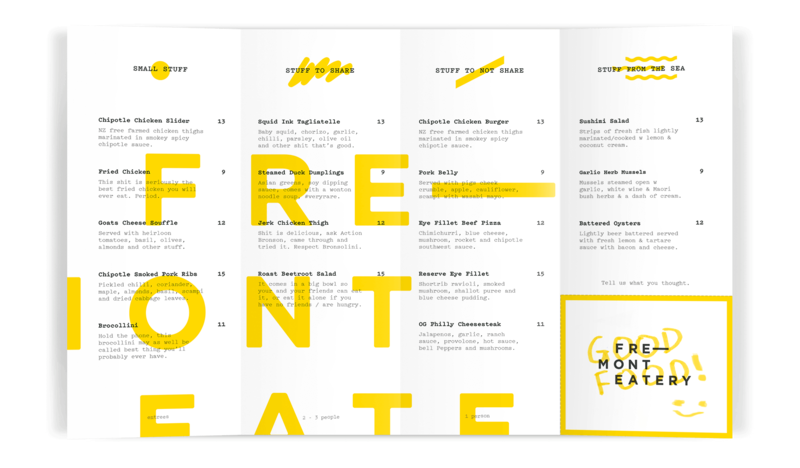 I designed the menu whereby the dishes are put into condensed portion-based categories. (small stuff – entrees, stuff to share – 2 -3 people, stuff not share – 1 person) A small seafood rotation is included and can be replaced with the chef’s monthly specials.